There are four training fields with natural grass at the “Sheriff” sports complex. These fields are equipped with up-to-date automated watering system that allows keeping surface quality on high level, worthy not only of teams of National Division of Moldova, but foreign clubs spending training camps at the “Sheriff” sports complex, or preparing to official matches against regional teams. At the “Sheriff” sports complex there are three training fields with artificial surface. After deep analysis of artificial football surfaces manufacturers market, the sports complex administration decided to choose one of the well-known sports surfaces manufacturers, Canadian “Field Turf”, founded on 1988. Surface high degree reliability factors, conformities to the highest quality standards of international organization on standardization and great experience in the sphere of artificial surface manufacture became basic when choosing the surface of the given company. “Field Turf” production is known in many countries of the world. Today there are over 500 sports objects in various regions of the world, where “Field Turf” artificial surfaces are established. The “Field Turf” was awarded the prestigious award from the government of Canada “Export Award” for the success with which company production in the whole world is used. The presence of training fields with artificial surface gives a possibility not to interrupt training process even in winter. The field with combined surface keeps aloof among training fields of the “Sheriff” sports complex. 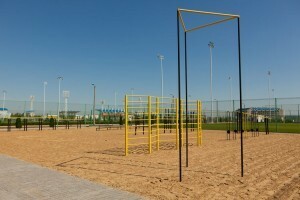 It is training field consisting of two zones: with sandy and grassy surfaces. 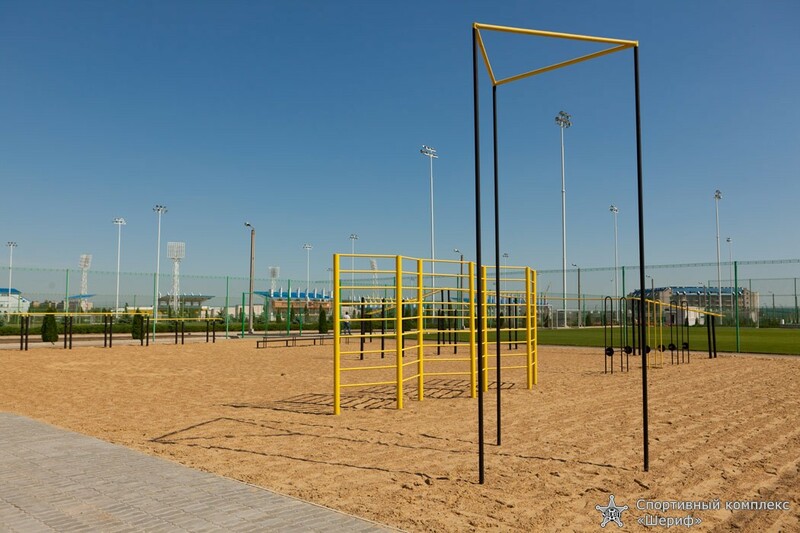 An availability of such field widens considerably possibilities for football players’ trainings, and also allows sportsmen to train in other sports. All training fields equipped with effective up-to-date drainage system from the acknowledged world leader in the given sphere – Swiss “Motomatic”. Drainage system allows providing quick disposal of all types of surface moisture that maintains a functionality of the surface on training period. The drainage has also sufficient systems of self protection from pollution in order to avoid frequent cleanings and repairs of a system even when it is in active operation. Fields illumination by intensity of 400 lux is carried out from tall masts located in corners of every field allowing training process not to be interrupted in the evenings. All fields have individual perimeter enclosure by height of 5 meters, and behind goalkeeper area – 7 meters. Fields have convenient road communication among themselves and approaches to entrances.